I've wanted to visit Iceland for years. Early last year a brilliant deal on Secret Escapes popped into my work inbox and after quickly sending it to Jon we were booked on a trip to the Land of Fire and Ice in October. I should probably start off by addressing the cost of visiting Iceland. The one thing I kept reading and hearing about Iceland is how eye-wateringly expensive it is so I did lots and lots of research to find the cheapest places to eat and low cost things to do. The hours of pouring over forums and travel blogs paid off though and the trip didn't break the bank, but yes, it definitely wasn't cheap. 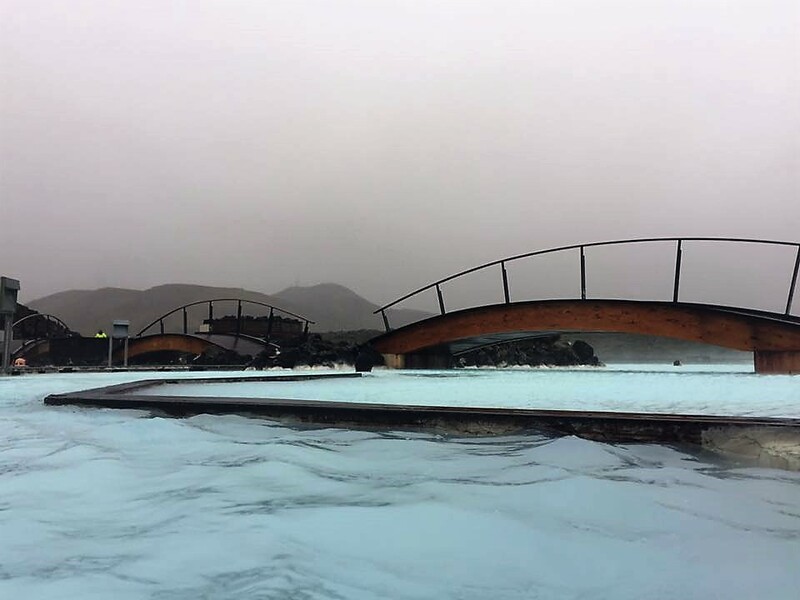 Spending the day at the Blue Lagoon was a dream come true, and despite going on a day when it was blizzarding and pouring with rain at the start of the day, I loved it. We went for the the Comfort package which got us two types of face mask, a drink and a towel on top of lagoon entry. For us it worked really well, just having to show a wrist band to get a drink and knowing we wouldn't have to wait around to pay on our way out (£10 for a pint by the way...) was a perk. On the day we went it was the first snow of the season, getting onto a coach in a blizzard and driving through what seems like an alien landscape was amazing. It took some coaxing from Jon to get me to run out of the lagoon building and into the water, it was freezing outside! Once I was in the water I soon warmed up as long as my shoulders were under the water. The great thing about the lagoon is finding pockets of extra hot water, I passed lots of people exclaiming that they'd found a hot patch and savouring in it for a while. We took a case with us so I could put my iPhone in it to let us take photos, I can testify that it was 100% waterproof thanks to a slight mishap that saw Jon drop it into the water. Those things do not allow your phone to float. I'm sure you can imagine the utter panic over the next few minutes til he found it with his feet at the bottom of the lagoon. Another thing I'd read was how it's best to keep your hair out of the water as it wrecks it. The Blue Lagoon supply conditioner in the showers that you are required to use before you go into the water, my tip would be to pile it on. More than you think you'll need, layer it on. I didn't put enough on and ended up going under the waterfall (amazing for tight muscles in my shoulders) so my hair was in a state until we got back to the UK and I was able to buy clarifying shampoo. I washed it twice with that, then with regular shampoo and followed it with two lots of regular conditioner and it was back to normal. I researched places to eat extensively before we went away, I wanted to ensure we ate good food without weeping when the bill came. 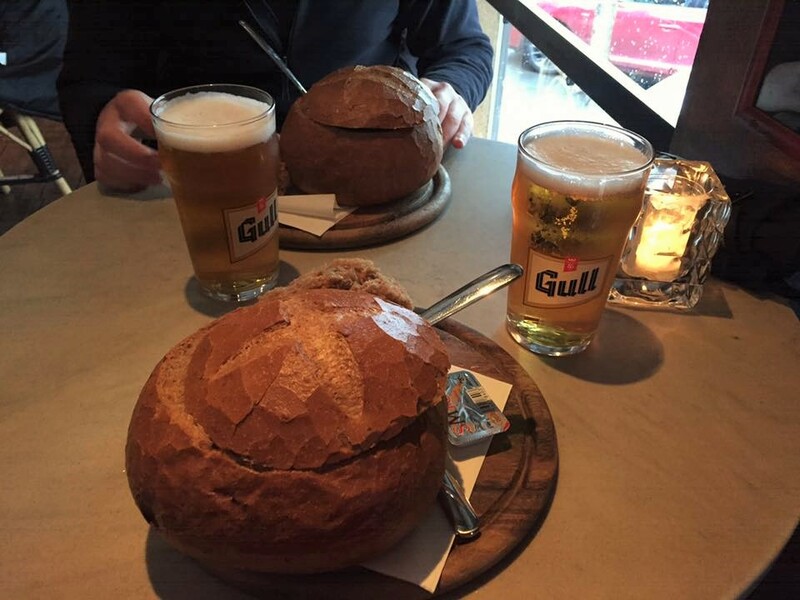 Still, the cheapest meal we had was soup in a bread bowl with a pint each. This was roughly £30 from Svarta Kaffid. I really liked this restaurant, it was super cosy and a great place to escape the cold and people watch for a while. 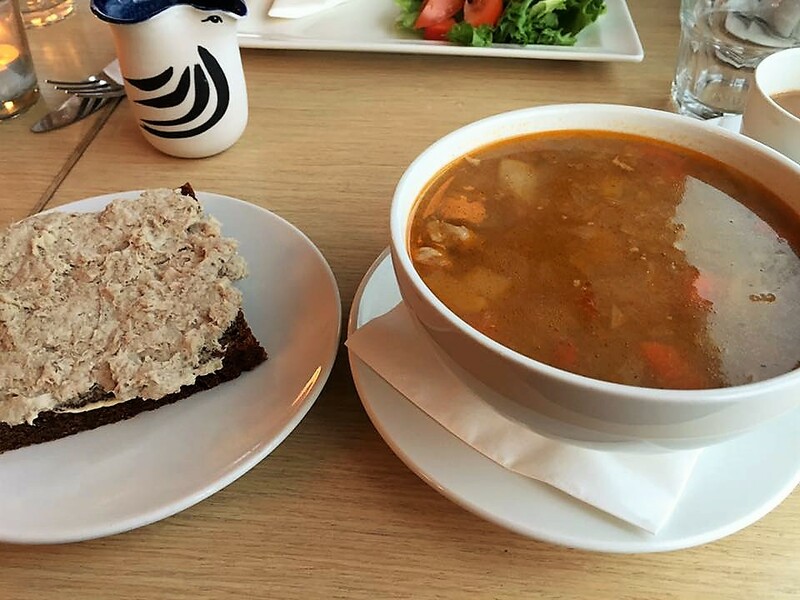 We both had the spiced meat soup with a pint of local beer, I'd recommend it to anyone looking for something cheap but tasty in Reykjavik. Another place I'd come across before we got to Iceland was Cafe Loki. It was right across the road from Hallgrimskirkja, which made for a great view over early dinner on our first day in Iceland. We both really wanted to try traditional Icelandic food and this place was great for that. I decided to go for the meat soup offer which was a big bowl of meat soup, a cup of coffee and lamb pate on rye bread. All of it was great, the soup contained plenty of meat in good sized chunks. 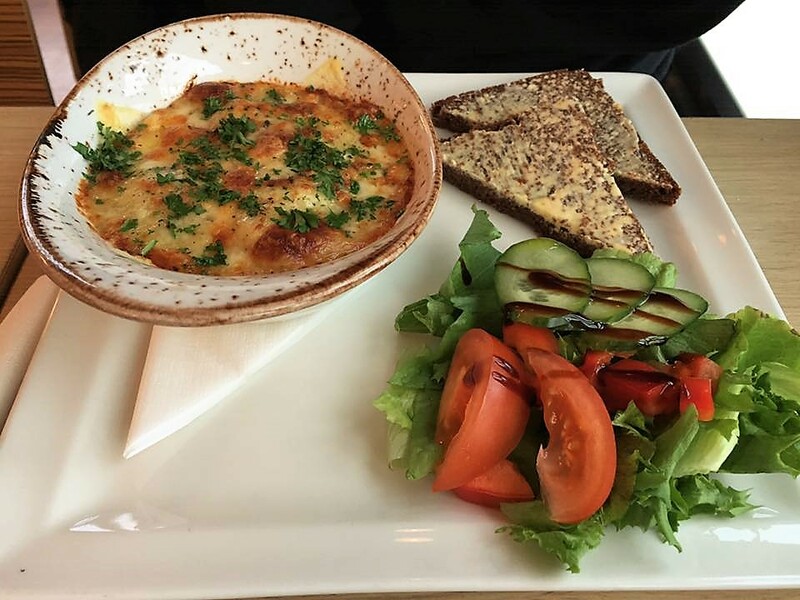 Jon opted for gratinated mashed pie, which came with salad and rye bread. I had immediate food envy, which for me is quite something as I don't tend to like fish normally. Hopefully I'll be able to replicate this dish in the future. We both decided to have pancakes for dessert, not something we necessarily needed but who can resist a pancake? 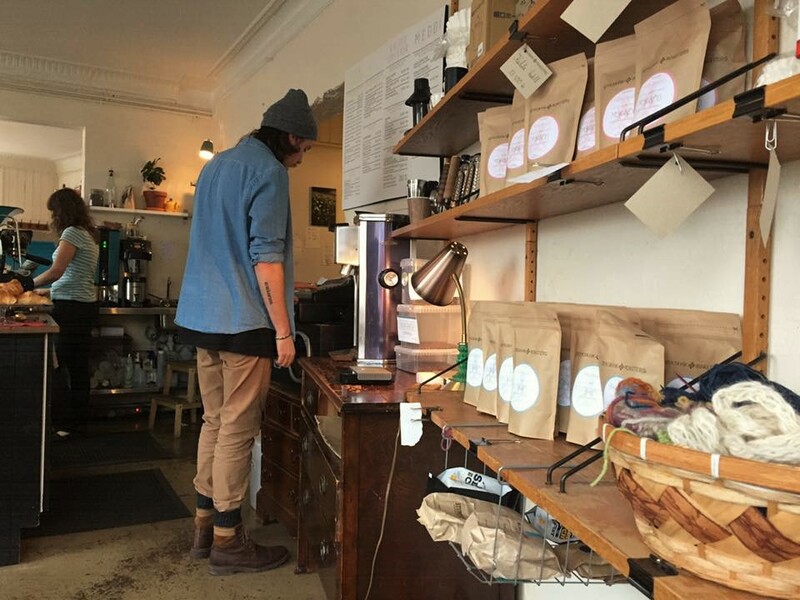 On our day designated to exploring Reykjavik we stumbled across Reykjavik Roasters. It was almost like sitting in someone's living room, with vinyl being played and crochet doilies on the tables. I loved it. The coffee was strong with a good kick, just what I needed after walking around for most of the day. 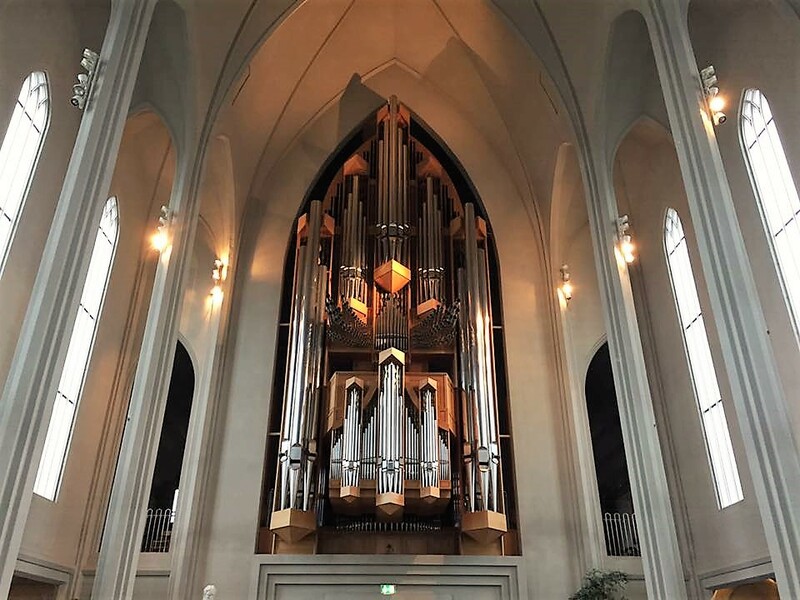 Hallgrimskirkja is one of the most iconic buildings in Reykjavik so there's more or less no way of going to the city and not running into the church. It's huge and imposing and offers the best views of the city. 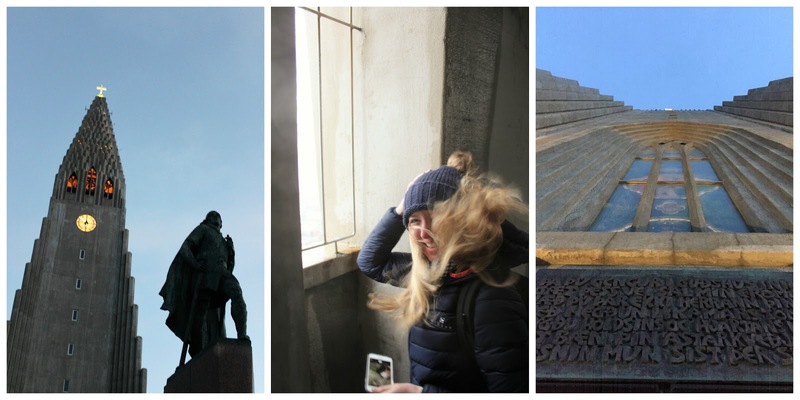 We seemed to have picked one of the windiest days to go up to the top of it which resulted in hilarious photos of the two of us not being able to see anything thanks to my hair flying everywhere. The inside of the church was modest despite how large the structure is, it was nice to find a place to find a bit of peace despite it being full of tourists on the day we visited. Reykjavik is a small city, unless you're really into shopping (and spending heaps of cash doing so) it's easy to see it in one day. We started off by walking down to the sea from our hotel and walked along the seafront towards the city, past the sun voyager and to the Harpa. Cardiff has it's Millennium Centre, which as a building I've always found impressive but Harpa was even more impressive. Wandering around the city we came across various trolls and creatures in the street, I love the fairy story culture the Icelandic people have. We also managed to find a Christmas shop, obviously I had to go in and buy a decoration! The troll head (way nicer than it sounds, I promise) was hung up proudly at Christmas. I loved our trip to Iceland, we were already planning a two week trip before we got back so we can get out and see the landscape. Here's to more travelling adventures in 2017. This looks and sounds like an amazing trip! I was saying to Pete yesterday that I really want to go to Iceland... Maybe 2017 will be the year! It was definitely one of those 'lets stop talking about it and do it' moments. I think somewhere like Iceland (or any expensive country) can easily turn into one of those places you talk about going but never get there, for me it's New Zealand. I've been banging on about going there for over 10 years and I've still not made it! Hopefully 2017 will be your year!